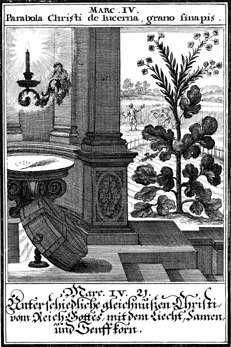 An illustration of the parable, together with the parable of the Growing Seed, which follows it in Mark. The parable of the lamp under a bushel, (also known as the lamp under a bowl), is one of the parables of Jesus. It appears in Matthew 5:14–15, Mark 4:21–25 and Luke 8:16–18. In Matthew, the parable is a continuation of the discourse on salt and light. "And no man, when he hath lighted a lamp, covereth it with a vessel, or putteth it under a bed; but putteth it on a stand, that they that enter in may see the light. For nothing is hid, that shall not be made manifest; nor [anything] secret, that shall not be known and come to light. Take heed therefore how ye hear: for whosoever hath, to him shall be given; and whosoever hath not, from him shall be taken away even that which he thinketh he hath." "No one, when he has lit a lamp, puts it in a cellar or under a basket, but on a stand, that those who come in may see the light. The lamp of the body is the eye. Therefore when your eye is good, your whole body is also full of light; but when it is evil, your body also is full of darkness. Therefore see whether the light that is in you isn't darkness. If therefore your whole body is full of light, having no part dark, it will be wholly full of light, as when the lamp with its bright shining gives you light." The key idea of the parable is that "Light is to be revealed, not concealed." The light here has been interpreted as referring to Jesus, or to his message, or to the believer's response to that message. Jesus quotes a pessimistic proverb on how the rich get richer and the poor keep losing even the little they have. He later denounces the saying in the next parable in Mark, which alludes to Joel 3:13 in assuring that God's judgment on the ruling powers will come and holds out revolutionary hope to those resigned to thinking that nothing will ever change. The parable is the source of the English proverb "to hide one's light under a bushel", the use of the word "bushel", an obsolete word for bowl (now relegated to usage as a unit of measure), appearing in William Tyndale's translation of the New Testament: "Neither do men light a candle, and put it under a bushel, but on a candlestick, and it lighteth all them which are in the house." ↑ John R. Donahue and Daniel J. Harrington, The Gospel of Mark, Liturgical Press, 2005, ISBN 0-8146-5965-9, p. 149. ↑ William L. Lane, The Gospel According to Mark: The English text with introduction, exposition, and notes, Eerdmans, 1974, ISBN 0-8028-2502-8, pp. 165–166. 1 2 3 Barbara E. Reid, Parables for Preachers: Year B. The Gospel of Mark', Liturgical Press, 1999, ISBN 0-8146-2551-7, pp. 106–107. ↑ Joel B. Green, The Gospel of Luke, Eerdmans, 1997, ISBN 0-8028-2315-7, p. 329. ↑ Wilson, F. P. ed. (1970). The Oxford Dictionary of Proverbs. Third Edition. Oxford University Press. p.371. "Hide one's light (candle) under a bushel, To." Wikimedia Commons has media related to Lamp under a basket.